Two species of the Galapagos Islands that I was lucky to see was the land and marine iguanas. 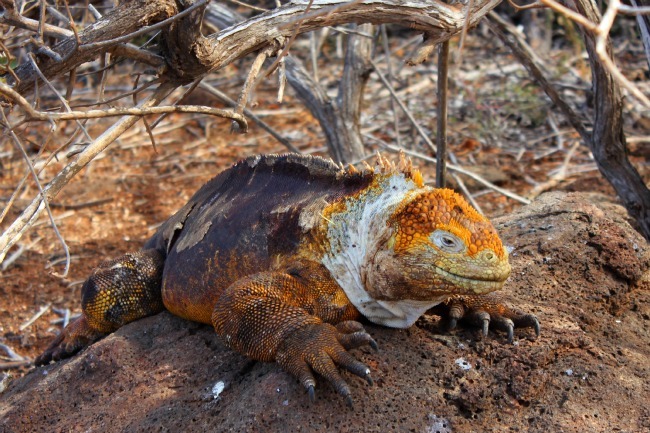 The land iguana is not as easy to spot as other creatures – its not one to come out in the bright sun and does blend a lot more into the landscape of certain islands, unlike its counterparts like the Sally Lightfoot crab or the Magnificent Frigate bird. Speckled in shades of brown, sand, grey and a bit of rust, the land iguana is looking to keep cool, and often uses the cactus as a perfect blocker for the unrelenting sun. I’ve always thought these animals are throwbacks – resembling the creatures of our planet’s past, like a dinosaur, with its exterior looking like it could withstand anything. On North Seymour Island, the landscape was arid like a desert – cactus, bleached sandy soil and vegetation that was low, dry and sparse – and a favourite home of the iguanas. 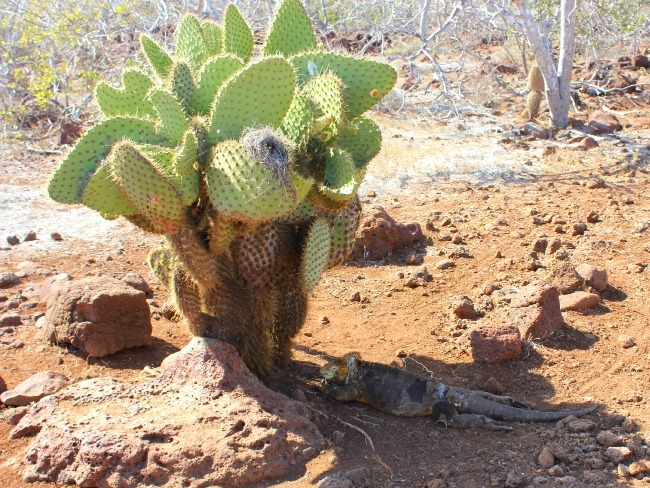 On the first occasion I saw an iguana, it was placidly beneath a cactus, aware there was someone close, but more interested in its own time to nap than anything else. The second time I saw an iguana was later in the same hike, as my group got closer to the shoreline, and the iguana was propped up on a rock, as if posing for its National Geographic Magazine cover image. It seemed poised to do something, although as we took photos, it didn’t move at all. The last iguana I saw was in the sea – a marine iguana. I had stopped snorkeling and was swimming slowly and noticed something in my peripheral vision. The iguana’s head was above the water surface, as it swam along the shoreline – and as we exchanged glances, it didn’t seem as perturbed about me as I was about it. I was sadly without my waterproof camera. As it kept swimming, I could slightly see its tale swinging back and forth in the sea, almost beckoning me to follow.